This entry was posted on January 4, 2013 at 11:14 am and is filed under Drama, thriller with tags 2010. You can follow any responses to this entry through the RSS 2.0 feed. You can leave a response, or trackback from your own site. Yeah, it’s wasn’t great Nostra. The original is far superior as they so often are. You should seek that one out. In completely unfamiliar with these films. Sounds like I should hunt down the original. Interesting cast here – two really good actors and Oscar winners whose careers haven’t quite blossomed as expected. I still like both though and its a shame this film didn’t pan out. I feel the same about the leads Keith. Excellent actors and they are both good in this but seriously, get the original German film. It’s well worth a look. Forget about this one. Why watch the pale copy when you con go for the original? I’ll look for the German version. My thoughts exactly Victor. Hunt down the original. It’s an absolutely brilliant film and if my memory serves it would be very close to getting top marks from me. I actually have the original movie Mark. Good stuff. Based on the actual Stanford prison experiment in the ’60’s. Here’s a good doc on the subject. A great companion piece. Excellent Dave. I’ll swing by on that link when I have time. 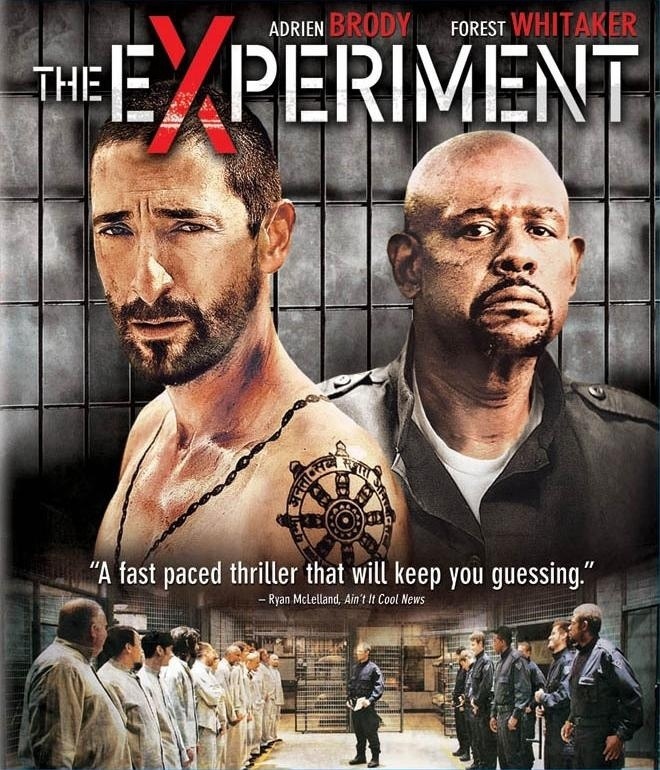 The original “Das Experiment” is a brilliant film though isn’t it? I loved it but I can’t say the same about this remake. I try to stay clear of Forest Whitaker films…but he just keeps sucking me back hoping he may redeem himself, never happens. I don’t really mind Whitaker. He was great in the Last King of Scotland and quite good in this film but it probably is wise to steer clear of this one and check out the original. I don’t like to judge a book by its cover but that poster/DVD cover or whatever it is is just atrocious! I’m not aware of either of these but I remember doing research on the Stanford Prison experiment so it sounds pretty interesting. The original at least. Yeah, the DVD cover says it all really Chris. Definitely check out the original though. It’s brilliant. I do like Adrien Brody and Forrest Whitaker. It’s a shame this movie turned out to be yet another bad English remake. Like so many before it and likely after after it Steph. Remakes tend never to do a film justice. I would check out the original German film though. Thats definitely worth investing in. I’ve never even heard of this Mark. Well suffice to say I probably not going to see this one. You wouldn’t be missing much Ruth. The original, however, is a fantastic film. If you’re a Prison Break fan, you might get something from this man. It’s not all bad but I had seen the original years ago and it’s a far superior film. If you haven’t seen the original then there’s a chance you’ll enjoy this more than I did. Dont recall seeing the original which is scandalous really! Love a good prison flick! If you ask me, I’d ignore this one and go direct to the German one man. That’s an absolute corker! Ouch! I feel as if I’m on a deserted island here. I certainly didn’t feel duped by the “Prometheus “trailer mainly because I really like the film. But granted, some people did go in with unrealistic expectations and the trailer fed that. Now I have to say I didn’t think that “The Bourne Legacy” was a bad film, disappointing but not bad. And I live “Star Wars: Ep. 1”. It’s by far the weakest of the series but it has some great moments. I also like “MI: 2”. It’s a John Woo action picture through and through (Toned down for sure). I had a lot of fun with that. How on earth did that happen??? Stupid WordPress iphone app! LOL! Ack!!! I’ve avoided each nominated performance! Sounds like lucky me! LOL!!! !